A coal hauling road known as the Mainline to the Tidewaters. Taken over by the N&W and now part of the NS System. 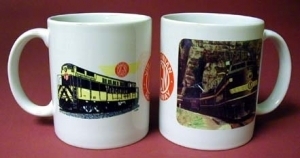 Beautiful coffee mug featuring two Virginian Railway locomotives, a Fairbanks Morse Train Master and a powerful electric, along with VGN logo. Coffee Mug featuring the newest VIRGINIAN widebody diesel in the Norfolk Southern Railroads Heritage Fleet. 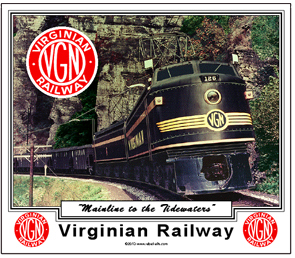 Featuring two powerful brute electric locomotives of the Virginian Railway. 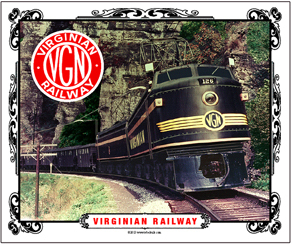 Mouse pad honoring the new Virginian Heritage diesel operated by the Norfolk Southern Railroad. A couple of powerful Virginian electric locomotives pulling a long coal drag through Virginia. 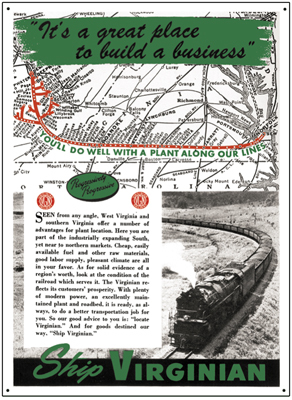 Reproduction of an advertisement ran by the Virginian Railway after WWII, promoting its vast business friendly territory. 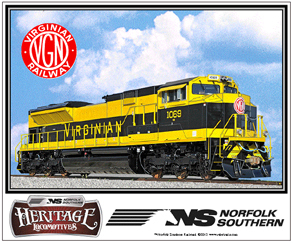 Virginian diesel joins Norfolk Southern Railroads Historic diesel fleet. 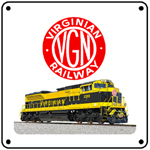 6 inch x 6 inch square tin sign of the historic Virginian Heritage diesel. A powerful locomotive paint scheme.